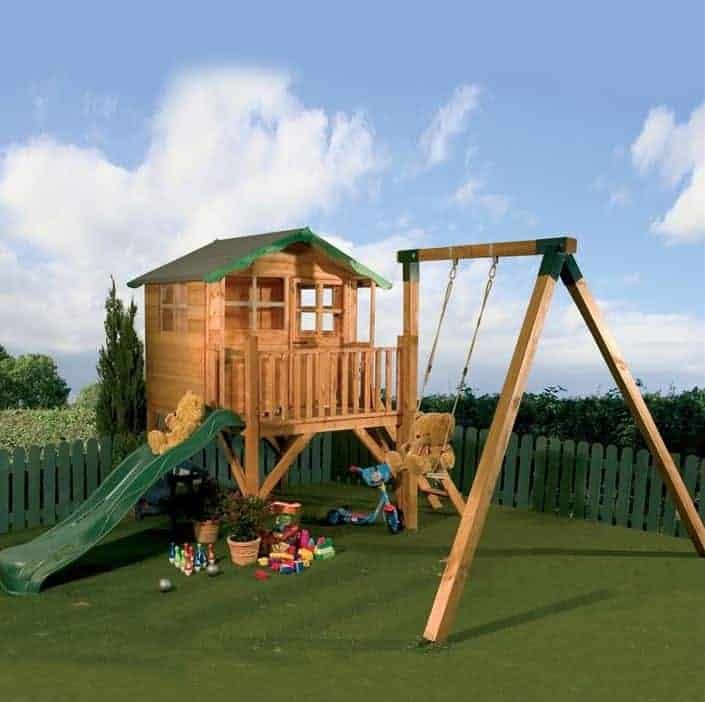 Wow is most likely the first word out of a child’s mouth when they see the amazing, 12 x 13 Waltons Honeypot Poppy Tower Playhouse Activity Centre. There is just so much fun to be had here that it is actually hard to describe it all. The actual playhouse is a good size at 4 x 4 and in here they can have all kinds of fun. 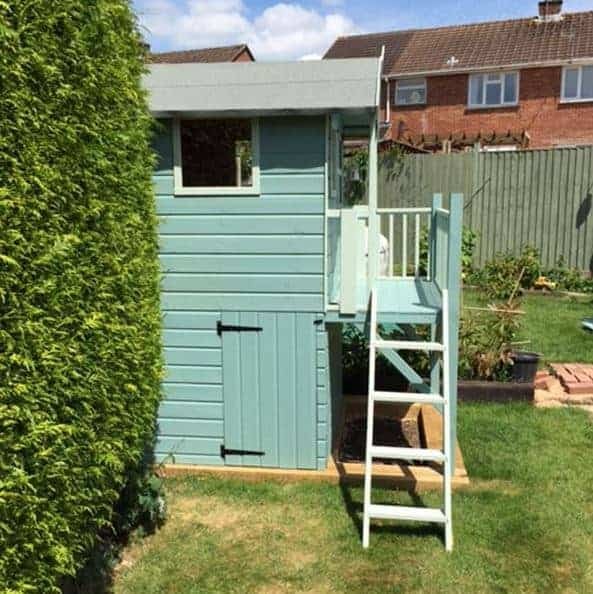 As this is a tower playhouse there is also a fun little decking they can spend time on. To get up to the playhouse there is a child safe ladder and then to get down they can take the wavy slide. Attached to this is a fantastic swing that is sure to provide hours of fun. 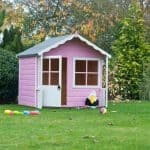 Despite being a lot of fun, this playhouse has passed a number of child safety tests and is made with very strong and reliable materials. 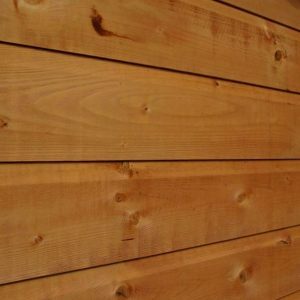 A very robust frame is just behind that very attractive, tongue and groove shiplap cladding so the walls keep the water out and can also take anything the kids can throw at it. The roof and the floor are made with solid sheet boarding which is strong, but also helps keep the costs down. There is never any danger of broken glass as all four of the windows are made with strong, anti shatter styrene. Wow where do we even start with this? From the picture you can tell that the 12 x 13 Waltons Honeypot Poppy Tower Playhouse Activity Centre is a playhouse that has a whole lot going on. This is like having a mini playground right in your garden. This does take up quite a bit of space at 12 feet 2 inches of depth and 13 feet 3 inches of width so this does require a fairly large garden. 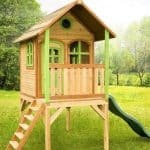 The actual playhouse portion of this product is 4 feet 9 inches wide and 4 feet 10 inches deep so it is a very good size, also as this is an elevated playhouse there is room underneath it for the kids to play as well. In addition to this there is a little decking area that has a safety railing around it they can have fun on too. 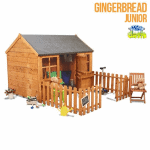 As well as the playhouse this set has another two major features that are sure to provide hours and even years of fun. First of all we have the swing, as you can see from the picture this swing is just as big a hit with teddy bears as it is kids. 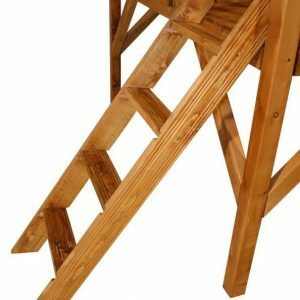 At one end of the decking where the playhouse is there is a lovely little ladder which has grooved steps so even if there has been a little rain, there is very little chance they will slip. You can either go back down these ladders or take the fun, wavy slide all the way down. The playhouse has an apex roof to protect the items inside from the rain. Waltons were smart enough to make sure the roof slopes down away from the decking and the slide so the rain will always just go onto the floor. Sand felt is used to cover some strong, solid sheet boarding. In all we are very impressed with what they have done with this roof. 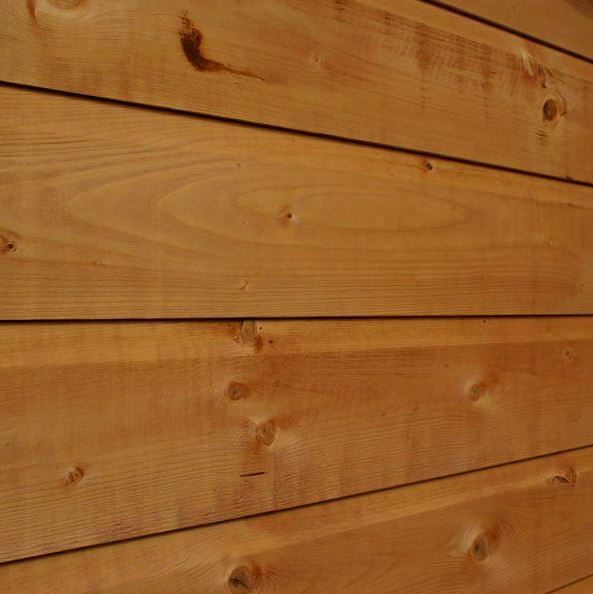 The playhouse has a very adorable look to it because of the tongue and groove shiplap cladding which makes up the walls. This is an impressive 12 mm thick and it is made to provide the ultimate protection against the weather and also deal with the crazy antics of kids playtime. Inside the playhouse is one very impressive frame, of course the kids could not care less about the specs of a frame, but we are pleased to tell you that as the frame is, 27 mm x 32 mm and the corners are actually double framed to provide even more stability and strength to the playhouse. For the floor, Waltons have used similar solid sheet boarding as they have for the roof. These are strong boards and we are sure the kids and their friends are going to be able to jump, dance and do whatever else their imaginations come up with. 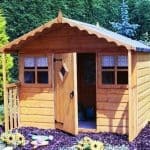 The wood used to make this playhouse is very nice, but it does require treatment once it has been built and also on a yearly basis. As of the time of this review, Waltons are actually giving you a free 5 litre tub of, golden brown wood treatment. Even if this offer is no longer on when you order, a tub of wood treatment is not very expensive. You are protected against rot with a very generous 10 year guarantee, but please note that for the guarantee to be valid you must treat the playhouse. The 12 x 13 Waltons Honeypot Poppy Tower Playhouse Activity Centre has a charming single door that is on the ladder side of the decking. This door is an impressive size at, 2 feet wide so even their large teddies and toys can be brought inside. There are finger gaps to prevent them trapping their fingers in the door and heavy duty hinges have been used so that the door can take the odd slam it is sure to get over the years. As you can see there is a very nice, large window on the door and that is something we really do like. Including the window that is on the door, the playhouse has four windows. These are made with 2 mm thick, anti shatter styrene so there is no worry about broken glass anywhere near the playhouse. There is a window on each side, one on the front and of course the one we already mentioned right on the door. It is always kind of hard to critique a playhouse when it comes to security. 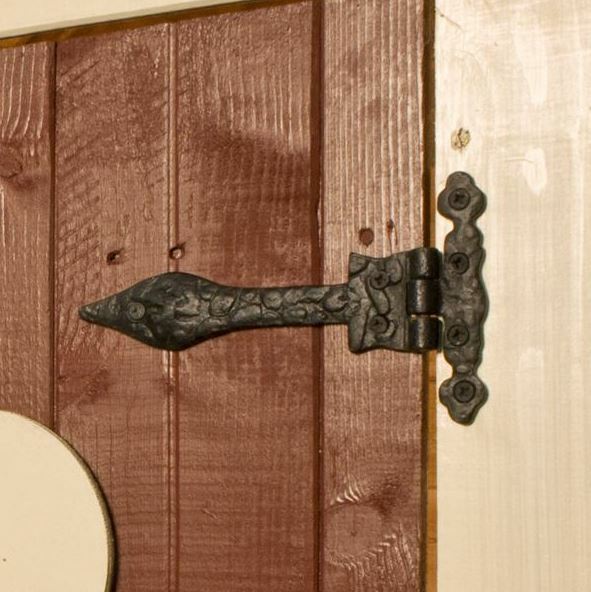 There is no lock on the door, but honestly you really would not want one as it would be far more hassle than it is worth. The door though does shut very securely so when they are not playing inside, the door will not be swinging open in the wind. As the playhouse is at adult eye level and there are a generous number of windows, privacy is not something is offering. But from a parent point of view this is actually pretty great as you can look out the windows and enjoy being able to see the kids having fun in the playhouse. As you can see this is one just awesome looking playhouse and activity centre. There is just so much fun to be had here that honestly even if you could tinker with the design, we would not recommend that you do as the look of this is a huge part of the charm. So while there is not much customisation you could do, we do not see that as a negative. Quite a few extras are available with this and they all relate to the actual playhouse. First of all we have a cabin wooden kitchen, this is a well made pretend kitchen that costs, £49.99 this will let the kids fire up some imaginary burgers or even a juicy steak when their teddies’ boss comes round for dinner. The roofing felt can be upgraded from sand felt to, olive green superior duty felt for, £34.99. Waltons do also have an installation service, but at, £224.99 is a little pricy for our liking. 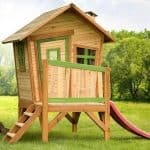 How this playhouse activity centre is able to be sold for the price they are asking when the quality is so high just amazes us! This is a playhouse that is made to be played with and played with a lot. So the materials used have been chosen because they are able to take a lot of abuse and last a long time. The actual playhouse is not all that large, but there is just so much going on here that we feel the 4 x 4 size will be fine. There is a whole lot going on here so it is going to take you and a friend a little while to build. Around 6 hours seems to be the average time, but despite there being so much to do, it is not all that hard a DIY job, just rather time consuming that is all. We can see this being something that is used for many years and the price of, £569.95 we feel is very generous considering all you get with this. Final Thoughts: What kid would not love to have their own little private playground in their own garden? The 12 x 13 Waltons Honeypot Poppy Tower Playhouse Activity Centre really is a lot of fun. It has three things in one as there is of course the playhouse, but as you have the slide and the swing there really is hours of fun to be had. We think this would be a huge hit with any child and if you are looking for something that is going to get them to take a break from Cartoon Network and spend some time outside then this is the way to do it. Also we feel the price is just right and that you are getting a lot for your money here.